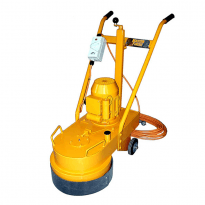 Concrete grinders are used in the surface preparation of concrete. There are a number of different ones available to suit different projects. The best equipment for your job will largely depend whether you need to level off a slab, prepare for new floor coverings or get that polished showroom look. The concept of a concrete grinder is very simple. It doesn’t matter if you’re using a small handheld grinder or a bigger single head machine - they work the same way. 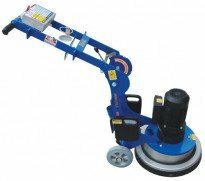 The head rotates, grinding the surface of the concrete beneath, and different attachments can be used to get you the results you want. Many of our machines come with a number of different attachments. Each disc or pad is suited to a different stage in the concrete preparation process. The plugs are for the heavy grinding work, discs for finer work and then the pad is used for polishing. As you progress with your concrete surface preparation, you will need to switch plugs and discs. Switching plugs is very easy (we always recommend you wear gloves). Get a hammer and tap it on the plate near the plug and the plug should pop out. To put plugs in, just push them with a bit of force and they will bind in. When it’s time to change from plugs to a disc, take the plug out and put in the magnetic plug that comes with the discs. Next, put the insert through the disc and then attach the disc to the magnetic plug. Tip: When changing discs back to plugs, make sure you take magnetic plugs out. To change the discs on a smaller grinder/edger you’ll need to find the locking pin on the side of the machine to lock it in place. Once locked, take a spanner and use it on the centre nut to remove the disc. Replace with the new disc and tighten up again. If you have any questions about our equipment or need advice on the best equipment to use, the team at your local Kennards Hire branch should be able to help you. For more information get in touch with your local branch today. 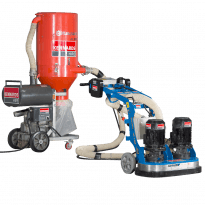 A versatile, single phase high speed concrete grinder with a well-balanced weight capable of delivering productivity and performance reliability. 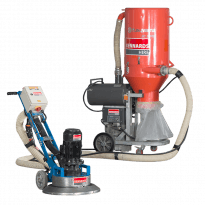 This 4hp grinder is easy to use and is ideal for concrete polishing, but also allows for concrete honing, removal of glues, paints and membranes. Heavy duty grinder suited to medium & large scale grinding and surface preparation (up to 1000sqm). Adjustable grinding pressures. Ideal for both indoor and outdoor floor surface renovations. Removes paint, traffic lines, fibre glass, epoxy and adhesives, expose aggregate or grind surface imperfections etc.